Few if any cities in the world have changed as swiftly and extensively as Beijing. When I lived there some 15 years ago, bicycles were kings and the relatively few motorized vehicles were subservient to them. Today the car is king, and the bullying four wheelers are blowing the little two wheelers off the streets. When I was in Beijing recently, it took me half a day to locate the apartment where I had lived in the 1990s. The quiet tree-lined lane I leisurely walked my daughter to school on is now lined with towering skyscrapers and has bumper-to-bumper traffic. I was shocked! For two decades, Beijing has been devastated by a vicious tornado in reverse: instead of flattening the landscape, this tornado has blown structures upward and outward. During the run-up to the 2008 Summer Olympics, when Beijing Taxi was shot, the pace of development was a desperate sprint. Directed by Miao Wang, who was born in Beijing and educated in America, Beijing Taxi premiered to a full house at the SXSW Film Festival in Austin, Texas. This is an insightful documentary, an intimate portrait of three taxi drivers from three generations, two men and one woman, working and living in the traffic-congested, pollution-spewing vortex of this radically changing urban landscape. Through their eyes and in their words -- taxi drivers throughout the word are not reticent to speak out -- we experience their frustrations, fears, aspirations, and their need to adjust while longing for traditions. Our myopic mainstream media reports regularly on China, but usually in headline stories: China the manufacturing powerhouse, China with its quickly expanding and threatening military machine, China with a government hostile to human rights and democracy, and now China the banker who is holding the debt of heavily indebted America. Throughout the tornado of change over the last few decades, the world media has proclaimed the emergence of the "Chinese Superpower," even the "China Century." Yet Americans know practically nothing about everyday China, and nothing about the average Chinese. That is not good. Ignorance is the friend of manipulation. Americans need to be better informed. Americans need to be better informed not only about the big issues, but about the people of a nation that has one-fifth of the world's population. 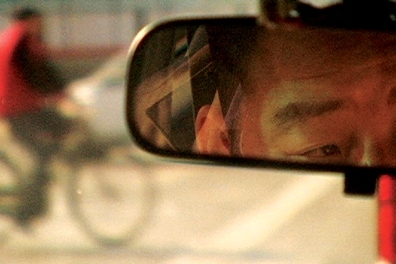 Beijing Taxi dips us under the mainstream media's radar screen and places us in the seat of a journey through the capital of China: a lyrical, funny and at times bitter journey through the working lives of three Chinese who once were called the proletariat but today are not quite sure what they should be called. In varying degrees, according to generation, they struggle to become comfortable in the new Chinese society where competition is good and getting rich is patriotic. There is the older driver approaching retirement and concerned about his health, whose youth had been swallowed by the terrible history of China. There is the middle-aged driver seeing his life through the lens of optimism. And there is the younger female driver restless for more freedom, more money, maybe even for something unheard of in China only a decade ago -- divorce. At this level of society, the economic miracle of the emerging superpower looks quite different. On this level, life is not easy. There is stress and hunger, not for food but for a better life; inequality is growing while health care is more expensive. There is concern for the future as they struggle through the present. Here, on the personal level, there is not much difference between Chinese and Americans. Of course that is always the case: the more you understand foreign people, the more they appear to be less foreign and more like you. Director and writer Miao Wang, with directors of photography Sean Price Williams and Ian Vollmer, delivers rich details and intimate portrayals. It's gritty and it's beautiful; the focus on the subjects is sharp, yet you also get a sense of the larger China. It left me wanting to return to China, although this is a very different China than the one I lived in. On the screen I did catch a glimpse of the Workers Stadium, the major landmark near where I resided in the 1990s. I wondered if built today would it be called the "Capitalists Stadium?" Very possible. In the cities the proletariat has disappeared; now they're the Chinese working class, experiencing all the insecurity of working classes around the world. Not only the physical landscape of the cities, but the identity of the Chinese people is being changed. Beijing Taxi can take everyone -- from those who know essentially nothing about China to those news addicts who know everything reported in the mainstream media about China -- on a cinematic ride through the chaotic, full-steam-ahead, confident yet insecure Asian Goliath. More important, it can take everyone on a ground journey around Beijing to understand some average Chinese people. An important mission, and one that Beijing Taxi does extremely well.